That “something new” turned out to be the first new tomb to be unearthed in Egypt’s Valley of the Kings since the treasure-filled rooms of Tutankhamun in 1922 (a chamber found in 2006 is thought be a burial cache rather than a tomb). And its inhabitant was still inside. Bickel’s find was reported in January last year, but it was fascinating to hear her speak about the moment of discovery, so I’ve summarised her talk here. Bickel’s team at the University of Basel had been investigating a series of 18th Dynasty non-royal tombs in a side branch of the Valley of the Kings (despite the name, only about a third of the tombs found here belonged to Pharaohs). While preparing to close up a large tomb called KV40, they found a depression in the sand, barely a metre away from the shaft. But it would be months before the team could investigate further. It was 25 January 2011, the day that the Egyptian revolution began, and Bickel didn’t get permission to excavate the mysterious feature until 2012. Bickel was intrigued by the hole but insisted on calling it “feature KV40b”. “I didn’t want to speak of a tomb,” she says. The team removed the blocking stones and poked a camera into the hole, to reveal what they had barely hoped for. An undisturbed burial. There wasn’t any treasure, however. In fact, the scene was quite moving in its simplicity. The tomb was half-full of rubble and stones, flattened into a neat surface. On this were just two things. A wooden coffin, covered in dust, and propped up next to it, a beautifully-painted wooden stele. 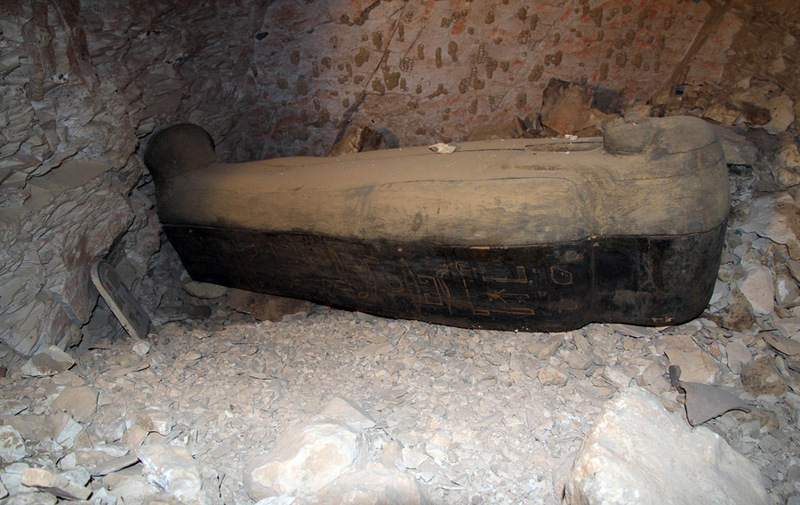 Bickel and her team recognised fairly quickly that although this was an 18th Dynasty tomb, the coffin dated from the 22nd Dynasty, around the ninth century BC. This must be a secondary burial, in which an old tomb had been reused. 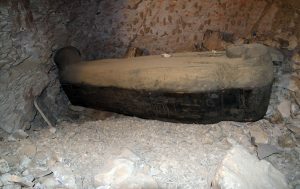 Lettering on the coffin indicated that its occupant was a woman called Nehemes-Bastet, “Singer of Amun”, whose father was a mid-ranking priest. “It’s a very interesting type of coffin,” says Bickel. It is simply made compared to some others of its time, “but you can feel the expertise of the draughtsman, with a very secure and rapid stroke”. The team were instructed to remove the coffin from the tomb immediately, for security reasons. 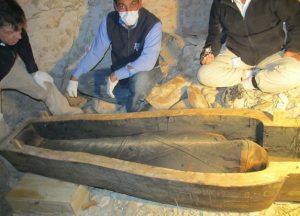 As that would involve tipping it vertically, they decided to open the coffin, to make sure that its contents wouldn’t be damaged by this operation. It took all day to ease out the eight nails that fixed the coffin lid to its base. After removing the coffin and stele, Bickel and her colleagues emptied the stones and rubble from the tomb, and found a few scraps from the original 18th Dynasty burial. These included two little heads from canopic jars, an eye (that had perhaps fallen off a coffin), a blue-and-yellow piece of glass, and a fragment of wood with the name of a princess: “Daughter of the Moon”. Oh yes, and the remains of a female body – torn apart, naked, and thrown towards a wall. The find nicely illustrates the changing uses of the Valley of the Kings. During the 18th, 19th and 20th Dynasties (from around 1470 BC) the valley was the favoured burial place for kings and their entourage. But in the 21st Dynasty (from around 1075 BC) that system fell apart. Security broke down and all accessible tombs were either looted, or their contents “recycled” by the state. Most of the royal mummies were stripped of their treasures, rewrapped and hidden in remote caches where it was hoped they would be safe from looters. I’m very excited about these discoveries, I can’t wait to hear more! I’ve been an Egypt fanatic since I was a kid ever since I watched a special Dr. Hawass was in. He’s awesome and I believe his excitement and love for Egypt and archeology is what makes it even more fascinating.